Potent, pucker-inducing, and pretty, cranberries have been around the holiday table for about 400 years. Native Americans used crushed cranberries to preserve pemmican, a dried meat mixture that, thanks to the benzoic acid in the little red berries, stayed well preserved and palatable over the winter. Pilgrims served cranberries at the first Thanksgiving dinner, starting one of many traditions that we still practice today. You may have tried cranberry juice and sauce, or snacked on the dried fruits. But after you learn how powerful these tart berries are, you may want to eat them all year long. If you've ever had a urinary tract infection (UTI), then you may have tried drinking the tart, astringent juice of the cranberry. Cranberries are high in anthocyanidins, a class of flavonoids that may help fight UTIs by preventing E. coli from sticking to bladder cells. We're not sure if cranberries can prevent UTIs but some promising studies have suggested it's worth trying. There's some evidence as well that cranberries might play a role in prostate health. Cranberries have a compound that can reverse and slow the development of dental plaque and periodontal disease and may reduce cavities by killing Streptococcus bacteria colonies. Since gum disease has been associated with a significantly increased risk of pancreatic cancer, your tasty snack or addition may serve double duty in prevention. Pancreatic cancer is on its way to becoming the second most common cause of cancer-related deaths in the United States. Without an effective screening test, most people are diagnosed when cancer has already spread and is no longer curable. And if that's not enough reason to be excited about the role of cranberries in periodontal disease gum disease may be connected to heart disease as well. Finally, with the cost of dental procedures and periodontal disease, cranberries may be good for your financial health as well. While you're chugging that ruby red juice, also remember that the flavonoids in cranberries may improve your cholesterol. While LDL levels changed little, some studies found a reduction in oxidized LDL. Yet cranberries appear to boost HDL, the "good" type of cholesterol. These reductions were seen primarily in daily consumption of up to 20 ounces of cranberry juice. We've all heard about the benefit of antioxidants these last few decades, and cranberries are loaded. Antioxidants work by cleaning up (neutralizing) the free radicals formed in our bodies through everything from toxic exposures to normal metabolic processes in the body. Free radicals do their dirty disease by causing damage to DNA in cells. The cumulative damage to DNA (mutations) is what sets the course for cancer to develop. Since fresh cranberries have more antioxidants than any other fruit, snacking on cranberries or drinking the juice might be a healthy way to cope with aging. The USDA Agricultural Research Service is working on a new variety of cranberries. They are taking the American cranberry and crossbreeding it with an Alaskan variety. 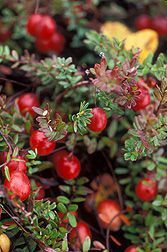 American cranberries have anthocyanins that are 3 to 5 percent glucose-linked, but the crossbred plant will have anthocyanins that are 50 percent glucose-linked. This will boost their antioxidant power, and also make them easier to digest. Consuming products made from the new super cranberry might improve your health more quickly since you'll be able to absorb the vitamin C, antioxidants, and anthocyanins very efficiently. These plants are still being grown and studied, so they can be cultivated on farms. At Cornell University, researchers tested extracts of cranberries on human breast cancer cells; to see what effect they would have on cell proliferation. In small doses over 4 hours, some of the cancer cells began to die. When the dose of cranberry extract was increased for the same number of cancer cells, 25 percent more of those cells died. The researchers kept increasing the extract dose, and also the time that the cells were marinating in the extract. Larger doses and more time resulted in greater numbers of cancer cells dying at a fairly early stage in the natural life cycle of the cell. We are still in the early days of studying the role of cranberries in breast health, and its unknown whether the effects of cranberry extracts on cancer cells grown in a lab would have the same effect in the human body, yet this is an exciting finding. With all of the toxic treatments we have for cancer, searching for non-toxic ways to treat the disease is a must. Much of the research we have on diet and cancer relates to foods that may reduce the risk of cancer developing in the first place. Fewer studies have looked at what role phytochemicals in food may play in cancers that are already established. Take a moment to check out some other foods that might fight cancer after it occurs. Cranberries are a versatile food. Use cranberries in sauce and chutney, with as little refined sugar as possible. Bake fresh, frozen or dried cranberries into bread, cookies, and pies. Try using natural sweeteners (honey, maple syrup, agave nectar) instead of refined white sugar to smooth out the tart taste of cranberries. When you choose cranberry juice, read the label carefully and avoid mixtures that are loaded with high fructose corn syrup. And when your sweet tooth urges you to raid the candy jar, snack on a small handful of dried cranberries instead. The American Indians and the Pilgrims were on to a good thing in cranberries. The preservative, preventative, and antioxidant powers in cranberries may someday be used to fight conditions ranging from gum disease to breast cancer. That makes them better than just a snack, a jellied sauce, or a bright string of red berries on a Christmas tree. Cranberries are one of the healthiest fruits you can eat. So pucker up! Dandekar, S., Deshpande, N., and D. Dave. Comparitive Evaluation of Anti-Microbial Efficacy of Cranberry Extract and Chlorhexidine Mouthwash on Periodontal Pathogens: An In-Vitro Study. Journal of Periodontal Practice. 2017. 2(1)2017. Jacob, J. Study Links Periodontal Disease Bacteria to Pancreatic Cancer Risk. JAMA. 2016. 315(24):2653-2654.